There’s something to be said about an album so arcane and compelling that writing an introduction to the review proves paralyzing. 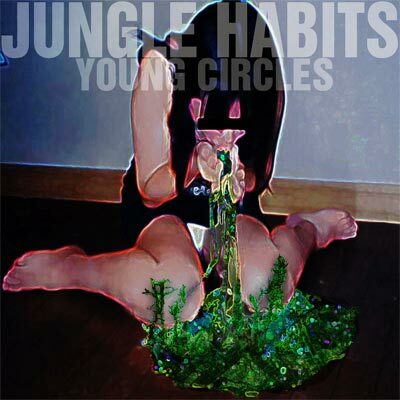 Young Circles’ Jungle Habits deserves an amazing lead, a pull-quote worthy of print, but I’m left rather motionless at the keyboard. Jungle Habits‘ spiritual rhythm and dynamic approach to songwriting makes the album one of the more interesting releases of the year, and one I easily recommend to any listener with an open mind. Judging by Jungle Habits lead track “Triangles,” the vibe for the album would appear to be that of progressive electronic music. Infused with plenty of live instrumentals as well, “Triangles” is built on a piercing, cavernous bass line, a surprising but apt canvas for Young Circles’ experimental song structures. And while it’s not immediately inviting, the lead singer’s undulating vocals provide a steep learning curve that later proves themselves rewarding, and the string arrangements in the second half of the track create a bright and attractive sound, in stark contrast to the album’s dark introduction. As “Triangles” fades to black, there’s a giddy anticipation for the next song, a sensation usually untapped on albums — but one which Young Circles use to propel the listener through the entire experience. “Triangles” is just prepping the listener for rest of Jungle Habits. Crazy mood swings, tempo changes, and instrumental breakdowns are all in half a track’s work for Young Circles. And somehow, maybe just barely, they make it all work. One of the album’s most stunning efforts is the nearly eight minute “Love Hitch,” a mix of Young Circles best talents. True to the rest of the album, “Love Hitch” begins as one idea and later reveals itself to be something completely different. Clanking pipes and soft piano keys, a simple but hypnotic attraction, create the illusion of a more subdued track. But as the filters and white noise drown out, leaving nothing but the vocals, a crash of 808s and hissing keys fill the foreground, a sensation equal to seeing a 3-D movie; the sound feels projected outward. These movements and shifts continue on the album. On tracks like “Changing” or “2012,” the more bombastic and electronics-infused sound is lost, but Young Circles’ spontaneity remains on the more classic takes. Whether it’s the tribal chanting and tambourine shaking on “2012” or the moping-up-at-the-end-of-the-night nature of “Changing,” Jungle Habits offers everything from freak folk to electro-pop, and does so in an incredibly undeniable and compelling manner. It might not be for everybody, but I recommend it to everybody.